Villa, 2 Bedrooms, 2 Baths, (Sleeps 4), extra child possible on airbed. Magic Castle is a spacious, open and airy two bedroom villa perched on the side of a valley overlooking Little Bay Beach, Guana Island, and the Caribbean Sea. This red tile roofed far-eastern pagoda is like a fairy tale from another land. Magic Castle is surrounded by a 2 1/2 acre estate of tropical gardens and natural woodlands, entered by electronic gate and long shaded driveway. Fruit and vegetables grow on the property in season, and shared. The entrance opens into the living and dining areas, with a well equipped gourmet kitchen. Doors open all around onto the garden-edged pool terrace and wide, covered al fresco dining deck. Soaring vaulted ceilings throughout add to the expansive feeling. Very breezy. There are ceiling fans in every room. The Master Bedroom Pavilion is separated from the rest of the villa by a sparkling 8x30 ft. SOLAR HEATED swimming pool and is wrapped by a covered deck with hammock and seating areas enjoying the magnificent panoramic view. Screen sliders on opposite sides of the room allow the balmy Caribbean breezes to pass across the pool and right over the King size bed in the middle of the large room. Adjacent is the Hot Tub, romantic under the sun or stars. All private. A second bedroom and bath is located in the main house where either twins or a king bed can be requested. Relaxing and comfortable, this Magical setting is perfect for couples or small families. Children over 8 years old welcome. The Little Bay Beach, just below, has been declared the best beach on Tortola by my guests. Usually deserted except for weekends. It is a few minutes walk or drive downhill. Many excellent restaurants, grocery stores, shopping and water sports activities are within 5-10 minutes drive. A 4 wheel drive vehicle is recommended. Most rental cars are 4WD. The owner/manager of Magic Castle and her elusive cat Ming and good watchdog Rocket live in an apartment below the villa behind a curtain of flowering vines. No part of the villa can be seen from there, assuring your privacy. Nor can sounds be heard in either direction. She's there with a wealth of local information if you have questions. For 20 years, Eva, and her now late husband Alan, owned and operated Baskin in the Sun, a scuba diving facility in the Dominican Republic, Turks and Caicos, Haiti and then Tortola. Currently, Eva is the science lab manager at the local community college HLSCC, in addition to managing Magic Castle as a rental villa. She is active in local eco and conservation groups, such as Reef Check and the Association of Reef Keepers, as well as a member of the college's Green Committee and advisor to the student Environmental Club. Gardening is a hobby she pursues, when there is time! Having spent many years in the tourist industry, she enjoys getting to know the many different guests she hosts, and ensuring they have the best time ever. Little Bay is a quiet valley with a magnificent and nearly private beach. dYou may see a dog walker in the early morning or late afternoon, but usually the beach is empty except for weekends, when a few residents may go to chill out. 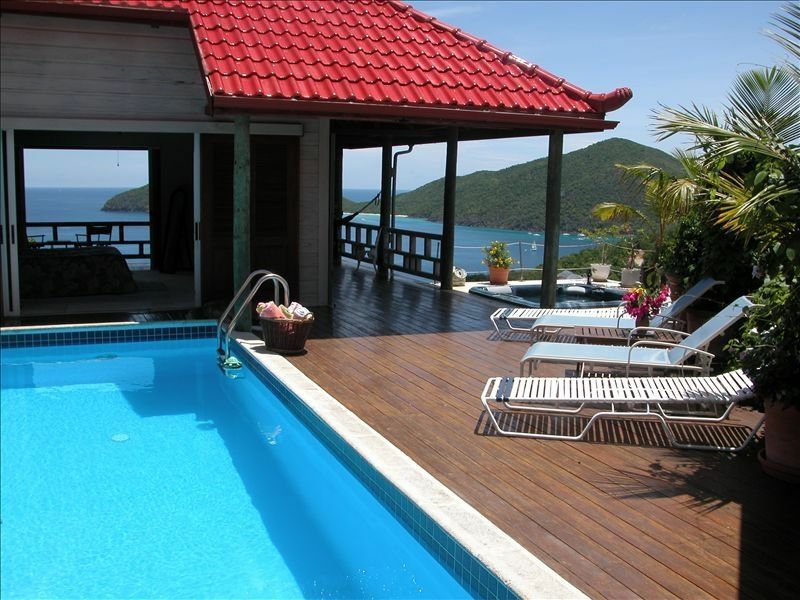 The view from the villa overlooks mostly green Guana Island and the Caribbean Sea. Magic Castle was built as our home. At first, the studio apartment below was rented, and my husband and I lived upstairs. Now, as a single, I live in the apartment, and rent the spacious home on the main level. Luckily, it has the location and design that is perfect for a vacation rental! You have complete privacy, but I am nearby if you need me. The villa is surrounded by natural woodlands on a 2 1/2 acre gated estate. This not only ensures your privacy, but is a natural habitat for chirping birds and other harmless critters. The night sounds will lull you to sleep! There are watersports facilities, restaurants, grocery stores, and other beaches and activities within 10 mins drive. An island tour will bring you to many beaches, trails on Sage Mountain National Park, marinas with many shops, busy Road Town, and much more. Other BV Islands are accessible by ferry, including Virgin Gorda where a trip to the Baths is a must. The villa is cool, airy, very relaxing, and private. The Master Bath has an open view, screened shower; a bidet. There is also an outdoor shower with hot and cold water for rinsing off after the beach. Over the hill 5 minutes to East End there are many services. Road Town with the largest grocers, shops, banks, etc., is a 15 minute drive. Little Bay Beach is 10 minutes walk downhill. This beach is usually deserted, and awesome! A spectacular view of the north coast of Tortola, Guana Island and the Caribbean Sea. All sand, no rocks. Natural woodlands surround most of the house. We are considered 'in the country.' Many birds conversing in the morning and evening. No other houses nearby. Overlooks Little Bay Beach, just below villa, as well as Guana Island and Caribbean Sea. The beach is a 10 minute walk or 3 minute drive downhill. View of the mountains on Guana Island and across the adjacent valley. It is very sparsely populated by one small resort. Most of what you see is unbroken green hillsides, and a white crescent beach. Overlooks Guana Island and a wide view of the sea to the north. Whalewatcing N of Guana Is. Jan. to April. All bed linens--mattress pad, sheets, pillows, blankets, bedspread. Private gas dryer, and solar/wind dryer outside, clothespins included! Electronic gate entry and private drive, parking. Includes bath, kitchen and beach/spa towels. Large living room, four screened double doors give view, receive breeze. Seats 5 plus additional chairs. Satellite 34 inch flat screen TV, DVD. Stereo CD, tape, AM, FM receiver. Large 2 vertical doors frig Has ice and water dispenser with super filter. Gas cooktop with 4 burners. There is also a coffee grinder. Four slice adjustable, also a toaster oven. Spices, condiments, paper towels, napkins, plastic items provided. Extra dishes and utensils for wedding parties, or otherwise. Large gourmet kitchen with center island and large oven, all major and many small appliances. Many condiments and spices provided. Long teakwood table in the Dining Rm seats 6, Half round table at center island in the kitchen seats 4 for casual munching. Outdoor table on the covered deck seats 6, plus small tables. Master Bedroom Suite has 45 inch flat screen TV, Living room has 34 inch flat screen TV. Dozens of books, fiction, reference, cook books, travel, garden, medical. Lots of puzzles, games, and cards. Lots of puzzles and games. Wrap-around wooden deck approx 2700 sq. ft., much of it covered, plus patio between pool and garden. The villa is basically one level except for 6 inch curb or 4 inch drop into the showers. A special path was built from a parking area to detour the front steps. One bathroom has a doorway not passable with the normally wide wheelchair, but the Master bath is fine. 8x30 ft. Solar Heated between the two buildings. Snorkeling gear, boogie boards, beach chairs and umbrella, beach bags, coolers, hammock, mini-fridge in Master Bedroom Pavilion, telescope, hair dryers, extra outdoor shower, electronic entry gate to this 2.6 acre Estate, Massage Therapist next door. No A/C, but ceiling fans in every room--very open and airy. Owner shares fruit and vegetables from garden when available. Eva opened her home to us and treated us like family. Very convenient to the Trellis Bay area. If you’re going to Tortola, this is where you want to stay! This was our first time to Tortola, and right from the start, Eva went out of her way to help us prepare for the trip. She gave us info about the area, rental car companies, and extra info about her property. We were her first guests since the hurricanes in 2017, but you’d never know. Everything looked terrific and her place on the hill has an INCREDIBLE view. The layout of the house is perfect for vacation and we hated to leave. Eva’s kindness and knowledge blew us away. We’ve stayed in a lot of places using HomeAway, but few owners have done things like bring us fresh fruit and stop by to make sure we know about the good restaurants and activities. We will absolutely stay here when we come back! Thank you so much for the great review! You were the perfect guests to have as my first since renovations. The second bedroom has been cleared and is nearly ready for the group of 4 coming at the end of December. After you left I had the opportunity to use the new hot tub. It is fabulous! It all keeps getting better and better! Exceeded every expectation! A million dollar view and a most gracious host! MCV was a perfect place to relax and be amazed by one of the most incredible views imaginable. Eva (the owner) was SO gracious and helpful in getting us settled in! My wife, and friends spent a terrific week at Eva's peaceful and beautiful home with a breathtaking view of the ocean. Eva was a gracious host ready to assist us with any need we had and information on where to go . It was hard to leave. we have visited quite a few of the Caribbean islands, but this was our favorite for relaxing and having our very own little paradise. It is my great pleasure to host wonderful people like you! The property is even more green and lush after this season of showers and sunshine. We just harvested the 4th stalk of bananas from the garden. The guests loved them! This review is slightly late but none the less, my wife and I truely enjoyed our stay enhanced by the owner Eva and her attention to us as bisitors. She met us at the airport upon flight arrival, directed us as we followed in our rental car to the villa. She provided a complete overview of the villa and amenties. We found the villa in spectacular shape, clean and functional. It has a view of the caribbean that was awesome. Can't thank you enough Eva for your generosity and grace. We will see you again and Levi says hello! Thanks so much for your wonderful review! It always gives me great Joy to know I have helped my guests get the most from their vacations. And I also enjoy meeting interesting people such as yourselves! Day trips by ferry or small aircraft to adjacent islands--each one unique. A must see is the Baths on Virgin Gorda. Helicopter tours, world acclaimed Full Moon Party at Trellis Bay or Bomba Shack, Performing Arts Series at H. Lavity Stoutt Community College Oct to May, sailing regattas, Emancipation Festival first Monday in August with parade, Botanic Gardens, Sage Mountain National Park, historic sites, cultural museum, history of boat building museum, boardwalk through the mangroves. The rates given are for 1-2 persons, except for the Holiday Season when up to 4 persons are permitted. For 3-4 persons, a $300 surcharge is added during Standard Season, $500 during Winter Season. Rates may change without notice. The minimum age for children is 8 yrs, due to the unprotected pool. I already have a dog, so pets are not accepted. Damage deposit waived if Honor System is accepted.